The concept of memory and its connection to reality is a theme that has produced cinematic masterpieces, with Akira Kurosawa’s “Rashomon” being one of the most prominent sample. Taiwanese director Leste Chen tackles this theme by adding scifi and crime thriller elements. The story takes place in 2025, when the erasing of undesired memories and feelings has become a trend. Jiang Feng is an author on the verge of divorcing his wife, Zhang Daichen.. In order to leave the painful memories of their marriage behind, he decides to erase them. After the procedure, he is given a device that can reinstate his memories, if he ever regrets his decision. However, the technology of the memory-erase dictates that in the case of reinstating, one has 72 hours to decide whether he will keep or erase his memories permanently. If this period passes, the changes become irreversible. Unfortunately for Jiang Feng, two events cause him more trouble than he could ever expected. The first one occurs just after the procedure, when an incident involving a double suicide at the Memory Center, causes him to lose his device and end up with a different one, without realizing it. Furthermore, when the couple meet again, Daichen refuses to sign the papers with his memories erased, thus forcing him to undertake another procedure. As the device, though, contains the memories of another man, Feng soon finds himself with memories of a murderer, who is involved with the unsolved killing of a woman. If that was not enough, when he decides to speak about his newly found memories to the police, he ends up detained in a cell by two detectives, Shen Hanqiang and Lei Zi. Leste Chen uses the quite complex script of Ryan Ren to present an intricate film that plays with the concept of memory through the question of “What would happen if our memories were not ours?” His build up of the story, though somewhat confusing, is quite good, as he manages to retain the agony through most of the film’s duration, combining the basic concept with crime thriller elements, and many plot twists. However, after a fashion, he seems to lose his sense of measure on this aspect, as the ending twists become hyperbolic, to say the least. Some scenes of surrealism, although minor, also do not help at all. This fault however, has to do with mainly the script rather than the direction, which remains quite good for the whole movie. 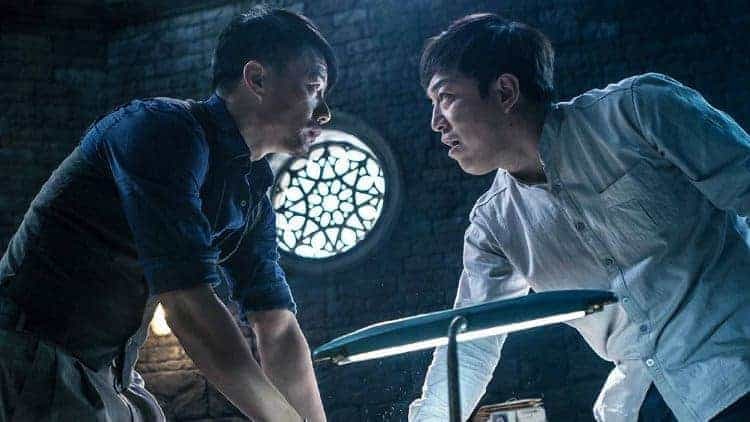 Hongyu Yang does his best of keeping the different aspects of the film understandable through his editing, and he succeeds for the most part, although the too complex story has him dealing with a very difficult task. Charlie Lam’s cinematography is one of the highlights of the movie, as he presents detailed images of beauty, which occasionally reminded me of a film-noir, both in color and in black-and-white, with the second tactic appearing in the scenes where Jiang Feng is remembering, in an additional effort to keep the film understandable. Bo Huang as Jiang Feng is impressive in a very difficult role, which has him change mentalities almost constantly, as the foreign memories start messing up with his actual character. Leste Chen anchors the film on him, and he delivers to the fullest. Duan Yihong and Liang Jieli are good enough in the good/bad, experienced/inexperienced cop roles they play, but they too, suffer from the way their characters develop. “Battle of Memories” is based on a very interesting concept, and its direction, acting, and production values are on a very high level. However, the issues with the script prevent the film from becoming a great cinematic experience. Definitely deserves a watch, though.